When a legend like Slash decides to make a solo album, he doesn’t do it by half, enlisting his friends to help him out, Slash has created what will surely go down as one of the greatest and most diverse rock albums of all time. The album starts with a bang with Ghosts featuring The Cult lead singer Ian Astbury. This is a fantastic way to begin the album, the chorus seems to sum this whole project up with the line: “Kill the ghost, that hides in your soul, Rock ‘n’ Roll.” As expected the guitar work on this album is stellar, then again, Slash very rarely disappoints. Up next is Crucify The Dead, with the legendary Ozzy Osbourne on vocals, on first listen this song seemed to be an anti Black Sabbath song, but after reading into it, it is Ozzy’s view on the demise of Guns n’ Roses. This is a great track with haunting lyrics and one of the best vocal performances from Ozzy in a long time. Surprising, one of my favourite tracks on this album is Beautiful Dangerous, featuring Fergie from the Black Eyed Peas. This song shows Fergie has really versatile voice, she really can sing! The two tracks on the album featuring the amazing voice of Myles Kennedy, Back From Cali and Starlight are also great. Myles is, in my opinion, one of the greatest singers in all of rock music, it’s no wonder he was considered for the job in Led Zeppelin. Doctor Alibi, featuring Lemmy, is a rocked up Motorhead song, and you can’t go wrong with that. Lemmy isn’t the best singer in the world, but his voice suits the music and his lyrics are amazing! Watch This, an instrumental jam, featuring Slash’s bandmate in Velvet Revolver Duff McKagan and Foo Fighterds main man Dave Grohl, is possibly the weakest track on the album, musically it is great, but it doesn’t offer much to the album as a whole, and at some points, it sounds exactly like (Velvet Revolver track) Slither. Nothing To Say, featuring M Shadows of Avenged Sevenfold is possibly the most “metal” track on the album. It has a sinister intro and the main riff is very Metallica-esque. M Shadows, as usual, offers a great vocal performance and the chorus is brilliant. The final track on the album, We’re All Gonna Die, Featuring the legend that is Iggy Pop, is superb. It’s a fun, catchy and hillarious rock song. Iggy’s lyrics are brilliant: “I wanna, I wanna, I wanna whip it out and pee on the ground!” for example. This is a great way to end the album, it just shows how much fun it must have been for Slash to make this album. I haven’t written about every track, but in all the album is definitely a must buy. If you call yourself a rock fan, then this album should be in your collection! Highlights: Truthfully, the whole album. Blink 182 and Guns N’ Roses Are to headline the festival. Other bands playing are: Paramore, You Me At Six, Limp Bizkit, Queens Of The Stone Age, Biffy Clyro, Lostprophets, NOFX, Billy Talent, The Gaslight Anthem, Weezer, Pendulum, Enter Shikari, Cypress Hill and All Time Low. 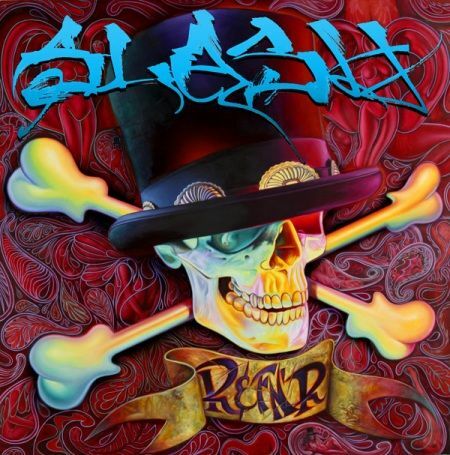 The track listing and album cover for the slash solo album have been released. Guns n’ Roses Stage Design? By the looks of things, the stage for Guns n’ Roses upcoming tour will have three catwalks… It’s kinda fitting since Iron Maiden nicknamed catwalks “Ego Ramps” and the fact that Axl needs three… you do the math. Guns n’ Roses… Tour Dates? Axl has finally announced some tour dates…in Canadia of all places, there’s also rumors of an Asian tour in December. The first show to sell out on Black Stone Cherry’s autumn tour was at the Glasgow Barrowlands, and I just happened to be there. Openers The Parlor Mob, were… pretty average, they didn’t really do anything special and the crowd just didn’t seem into it. Next up were Duff McKagan’s Loaded, and this set was very special to me. you see, the night before the show, i tweeted to Duff asking him to play new rose (The song by legendary punk band The Damned, also performed by Guns N’ Roses with Duff on Vocals) and before the gig my dad and I started speaking to the Loaded bassist ( really nice guy BTW) and turns out, Duff got my tweet and it was added to the setlist, needless to say i was over the moon, what made it even better was the absolutely fasntastic set that Loaded played, featuring songs such as Flatline, Dark Days, Sick and covers of Attitude by The Misfits, It’s So Easy by Gn’R (not to mention New Rose). Then, the headliners took to the stage, straight into opener Rain Wizard, which sounded even better than on the album. Then during second song Backwoods Gold, the lights went out, as guitarist Ben Wells said, because “they were rocking so hard!” So the band played in the dark for the rest of their set, it really added to the atmosphere. Chris Robertson, Lead vocalist and guitarist looked overwhelmed with awe and gratitude as the fans basically sung every word of the set, the highlight was Peace Is Free, where he didn’t really have to sing at all. Their superb set included songs from their self titled debut album, Folklore & Superstition and even tracks from the re-release of that album, plus they even threw in little snippets of Sweet Home Alabama, by Lynyrd Skynyrd, and Voodoo Child by Jimi Hendrix. Black Stone Cherry are an unbelievable band and deserve every bit of praise they have ever got. £15 a ticket for two awesome bands and one… not just as awesome, is fantastic value. This is the kind of thing that stay with you all your life, I know i wont ever forget it.